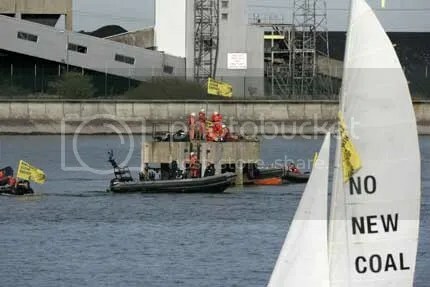 An individual who broke into the Kingsnorth Power Station on November 28th and shut down a 500 MW turbine for 4 hours has become an instant folk hero in the U.K. The person who carried out the break-in has been called both “climate man” and the “Green Banksy” , the latter after a famous U.K graffiti artist who maintained a secret identity for years. All power from the coal and oil-powered Kingsnorth station in Kent was halted for four hours, in which time it is thought the mystery saboteur’s actions reduced UK climate change emissions by 2%. [They must mean for the day–JR] Enough electricity to power a city the size of Bristol was lost. Kingsnorth has been the focus of an intensive anti-coal campaign and the scene of frequent civil disobedience by climate activists, because of the E.ON utility’s proposal to build 2 new coal-fired power plant on the site to replace the existing one, which, by law, must by closed down by 2015.. Six Greenpeace activists who entered the plants grounds and spread a huge banner on one of the chimneys were recently tried and acquitted for doing damage to the plant. (Climate Scientist and activist James Hansen gave testimony (PDF) during the trial.) The decision is considered a landmark one because the grounds for acquittal were lawful excuse, a legal principle that justifies damaging property if said property is being used so as to cause greater harm. In the case of Kingsnorth, the greater harm is the large quantities of CO2 and other GHG’s that the plant emits. The intruder then crossed a car park and walked to an unlocked door. But instead of going to the power station’s main control room, where about eight people would have been working, he headed for its main turbine hall, where no one would have been working at that time. Within minutes, says E.On, “he had tampered with some equipment” – believed to be a computer at a control panel – “and tripped unit 2, one of the station’s giant 500MW turbines”. “This caused the unit to go offline,” she added. “It was running at full 500MW load and the noise it would have made as it shut itself down is just incredible. CCTV shows that he then just walked out, and went back over the fence. As it turns out, the Green Banksy did not leave a lump of silver coal. When E.ON managers inspected the turbine hall, they found a sign made from an old sheet and gaffer tape that read simply “No New Coal”. “It was very crude,” said Highmore. Crude as it may have been, it was surely nowhere near as crude as trying to build a new coal-fired power plant in the age of Climaticide. kudos to the mystery saboteur, that’s the stuff of legend right there.